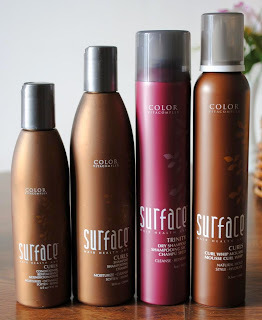 I was given the opportunity to review Surface Hair products. I received Curls Shampoo, Curls Conditioner, Curl Whip Mousse and Trinity Dry Shampoo. The Surface Curls line of products was just released early this month. They are made of organic cocoa butter, babassu seed oil and amaranth. The Surface Curls products are rich in vitamin K providing your hair with a healthy elasticity and control while containing Omega 3 and 6 fatty acid moisturizers. The Surface Curls line is for all curl textures and hair types. I love almost everything with cocoa ingredients. The cocoa smell is soothing and that is one of the things that I like about in the Surface Curls. I have been using the Surface Curls products for only a week and am loving them. These will be the only products in line that I will be using for quite sometime. The Curl Whip Mousse is interesting. This is the first whip mousse that I have ever used so far. The texture of the product is like a men's shaving cream except that this one is for hair. When using the Curl Whip Mousse, you have to shake the product well first and apply a generous amount on your damp hair. Using this, my hair stays soft and holds firm all day long. The Trinity Dry Shampoo is the second dry shampoo I have tried. This kind of shampoo is great for on-the-go individuals. This shampoo will last me a long time since I am a stay at home wife. I don't really have the use for it that much and am actually planning to give it to my hubby's daughter who is a nurse. Since my hubby and I have a few upcoming trips this summer, this shampoo will be very handy for those occasions. Trinity Dry Shampoo features an invisible, organic mineral infusion of volcanic ash and over 50 other naturally occurring minerals that create a crystalline structure. Combined with ocean water and lemon extract, the mineral rich ash cleanses and refreshes the scalp while absorbing free radicals and protecting color. Surface Hair is a high performance, salon exclusive collection of product lines that respects personal health and the earth. They are made with organic, gluten-free, sulfate-free, 100 Percent vegan protein and paraben-free ingredients. Surface Hair has been launched in 2008 and has since expanded to include Surface Men and Surface Skin, meeting market demand for products that perform yet offer sustainable, responsible eco-smart choices for clients. Surface is available exclusively at professional salons throughout the US and Canada. You can check them out at www.surfacehair.com for more information.